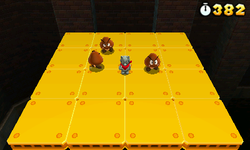 Special 4-1 is the first level of Special 4 in Super Mario 3D Land. The player starts out on a platform with a Roulette Block next to them, then the player will move onto an Elevator that will then start to move upwards. Soon three Goombas will drop down, shortly followed by three Tail Goombas. The Elevator will then move sideways and under a narrow platform that contains a ? Block that contains multiple Coins. The Elevator will then start to rise again, soon a Koopa Troopa and two Goomba Towers will drop down before the Elevator starts to move sideways and under another narrow platform that has a ? Block that contains a Poison Mushroom. The platform will then start to rise again and three Fire Piranha Plants will come into view and a Coin Coffer will drop down. The bottom left part of the Elevator and the part above will then fall down, as will the top right section of the Elevator with the part below it. After the Fire Piranha Plants, three Bob-ombs will drop down and after they blow up some Spiked Balls will be spawned, after the first Spiked Balls spawn, the sides of the Elevator will fall away. The Elevator will then rise through some Spikes and two Prongos will drop down, followed shortly by another two Prongos. After this, the top and bottom sections of the Elevator will fall away and shortly afterwards three Magikoopas will spawn, their attacks will need to be dodged three times before the Elevator arrives at the Warp Box. In the final area the player will need to use three Elevators to reach the top of the Goal Pole. Star Medal 1: Floating above the Spikes. Star Medal 2: Floating above the Rubber Platform. Star Medal 3: On the Castle at the end of the level.